How much do buildings weigh? All my life I have wondered about this, why don't the buildings sink into the ground because of their weight? Some cities, like Paris, France, can't build high as the city is on soft ground. I read some years ago that in a building each floor has to be able to support its own weight, plus the weight of the next floor above it. Now, how about skyscrapers? It really makes on think. Allowance is made for high wind swing, like the Husky (Calgary) Tower in Calgary and the (Space) Needle in Seattle. On windy days, do people get used to this problem in high rises too? I am just plain nosy! 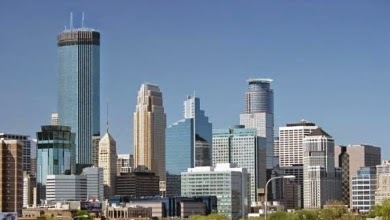 Minneapolis. Plenty of large buildings! The weight of high buildings is a big item to a builder. I was more aware of this after living in England and all the ancient buildings there. How do they determine the weight to the earth suitability conditions? Where would I get an answer to such a question? I've no idea, just better forget. you know what killed the cat... Leave it! I think Mom would have made a good engineer, had she had the right opportunities. Her curiosity was not matched by her ability to find answers to her questions, sadly. Bob and I told her that engineers know how to calculate building weight.